Could I have one more day, for a 4-day weekend, pleeeaaaase? This has been a busy time, I don’t even feel like I’ve had a chance to take a breath. My mother went into the hospital on Thursday, and we found out on Friday that she has colitis. She has been battling with pain in her stomach for a month or so, and the doctor finally put her in the hospital to pump antibiotics and fluids into her. I did try to rest a little on Friday, but we went out to get a birthday gift for a friend. His birthday party was on Saturday, and he turned six years old. His mama is a dear friend, and we’ve known each other forever. She had a pirate/Hawaiian luau theme, and we had a great time. The food was declicious and there were a lot of people there that I knew, so the company was good too. Here is a picture she took of us. And this is what she had for them to play on. Can you believe Leah, barely 32 lbs and 41-1/2 inches tall, went down this thing? It’s HUGE! Okay, so she only went down it once, and only when all the big kids were watching the birthday boy open his presents. I put her ear plugs in with an ear bandit, and she climbed up with a little bit of help from one of the bigger girls. She came flying down and landed in the pool of water. I didn’t think to tell her to close her eyes and hold her nose. She got water up her nose and I think it scared her at first. But after a minute, she started laughing and said that was fun, and that she “gargled” under water. She tried to go up again, but she slipped a little on the ladder and decided she had had enough. There was another little small pool just to the left that you can’t see in the pic, and that’s where she stayed almost the whole time. After we left there, we went over to the hospital to visit with my mother and then went to my aunt’s house to spend the night. I get there, and my aunt’s housecleaning lady tells me she has stopped up the garbage disposal with potato peelings, so I knew it was going to be a long night after a long day. I stood out in the sun for almost 3 hours because there was no rest for the mom of a little girl afraid of all the rowdy kids and splashing water. I had a pounding headache. We ate some supper and had some ice cream, and finally that went away. The cleaning lady went out and bought a little hand held plunger and she worked on that sink for about 20 minutes, but by golly, she got that thing unstopped. She was so upset with herself over stopping up the sink. But it could have happened to any one of us. My aunt told me she was worried she was retaining fluid again because she was having a little trouble catching her breath and she thought she was gaining weight. I checked her ankles and she didn’t have any swelling, and her breathing sounded okay to me. After consulting with my mother on the phone (I hated calling her up at the hospital about it, but I wanted to be sure I knew what I was doing), we weighed my aunt and she had actually lost a couple pounds. She weighed herself at the doctor’s office on Friday, and their scales are usually a little higher than hers at home. I think she just got herself upset over that and then her breathing was affected. I think she felt better after we weighed her though. After putting fresh sheets on the bed, and getting Leah settled down, I still got in the bed and was asleep before 11 pm. Not too bad. I must have slept pretty good, because I didn’t hear a thing, and I don’t think I woke up during the night. Leah woke me up this morning wanting pediasure and to watch a movie. And, I woke up with severe pain in my hip. I’m walking with a limp now. It’s been hurting all day. As soon as I finish this post, I’m going to bed with a heating pad and some Alieve. We finally got up and moving about, dressed, and packed up the car and went back over to the hospital to visit with my mother again. She was moved to a much nicer room today, so that will be nice for her. She might be able to go home tomorrow. We stayed there for several hours, then we started home. Of course, I had to listen to “I miss Grandmother” for a good ways. On the way, I decided to stop by a friend’s house. It was nice visiting with them, but again, I had to listen to a little more sobbing for a while when we left. We did get some bad news last night. A friend of ours in Indiana was killed in a car accident just a couple hours before. The friend was going to the grocery store to buy fish to cook for dinner, and she pulled out in front of a fully loaded ambulance, and it couldn’t stop in time. She was killed instantly. It’s very sad, because she was a beautiful, Christian lady, and she will be missed by her husband and her family. I know my mother will miss her terribly, because she was such a dear friend and was so very nice to my mother. Makes you think on things when something like this happens so very suddenly. We finally got home, and I am dog tired and not looking forward to getting up in the morning to go back to work. So I’m begging for one more day, please? Can somebody set the day clock to squeeze in an extra 24 hours before 8:00 tomorrow morning? Thanks and good night! right away, but I had to beg for a little time to put my clothes on first. Then she tells me she has to go out in the garage to get my present. This is what she came back with. The silly goose picked out a bunny rabbit just like hers. My friend took her out shopping last Thursday evening, and this is what she insisted that I would like most. The bunny looks mad, but at least I can tell him apart from hers. Notice the Hobby Lobby gift card? Thank goodness. and left just before 1:00. After we left the school, we dropped Leah off at my mother’s and went to go see “Race to Witch Mountain”. I thought it was a cute movie with a very simple plot. In my opinion, it was very entertaining. When the movie was over, we met Mama, Leah and my son, Ted, at Longhorn’s Steakhouse, my favorite restaurant. As a general rule, I detest being sung happy birthday to at the restaurants, but Longhorn has a short, sweet birthday lyric and it was over very quickly and quite painless. Mama brought me a cake, I think it was an Irish Creme Cake. We forgot to light the candles though, so here’s a picture of the half-eaten cake. My daughter was highly upset that we forgot to light the candles. since he graduated from high school a few years ago. I loved my birthday gifts. I got a new camera tripod and a MyPlace station for my laptop. Oh, and another Hobby Lobby gift card. A girl couldn’t ask for more. Thanks to my family and loved ones for spending the day with me and making my birthday very special. I would like to share some old photos and things that I found recently. This is me as a baby and birth announcements that my mother was sketching. Here is a picture from my 9th birthday party with my closest friends and family. Oh, and the bad weather? Mama had a pond in her yard. The local rivers have been under flood warnings all weekend and is predicted to continue until Thursday morning. Rain isn’t forecast again until Thursday. I have been receiving birthday wishes all week and I want to thank all my friends for remembering me. I have one particular birthday wish that I would like to share. I have a very good friend in Florida, and she has sent me the best birthday wish of all. I lived in Northwest Florida for almost 11 years and I loved living there. I love the white sandy beaches, the emerald green Gulf waters. The sun is brighter and the skies are bluer. The air is different there than it is in Middle Georgia. 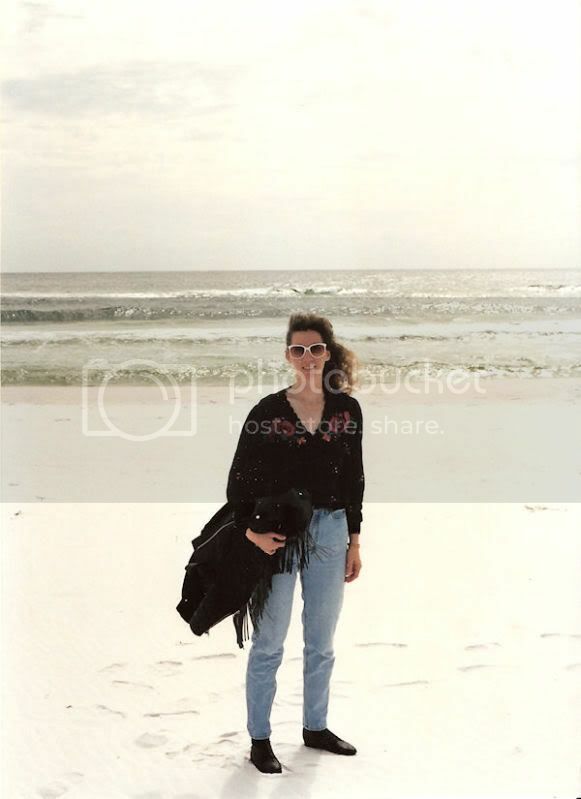 These pictures were taken during my first trip to the Gulf Coast. I have posted this before, and I would like to share it again. For the first bright star. My cares to be no more. To the ocean’s unceasing tune. And feel ever so blessed. Here is what my friend sent to me. She knew what would be the best present I could receive. Thank you, my dearest friend, for my wonderful birthday wish.